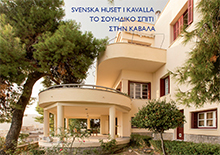 On 10 May 1948 the Swedish Institute at Athens was inaugurated in the Gennadeion Library of the American School of Classical Studies. The building on Voukourestiou 29, where the new institute would be housed, was not finished until the end of 1929. This was the time of the Civil War in Greece and it is rather surprising that Sweden received a permit to initiate an Archaeological School at the time. Two factors were decisive: Swedish archaeological fieldwork between the wars, and Red Cross relief work undertaken by Swedes during the Second World War. Heinrich Schliemann’s excavations at Tiryns, Mycenae and Troy made it very clear to Swedish scholars that nobody could study ancient cultures without studying the archaeological remains. Thus Classical scholars began travelling to the Mediterranean and contacting the excavators there, including those in Greece. The most important Swedish scholars to travel in the country at the end of the 19th century were Einar Löfstedt Sr., Julius Centerwall, and Johan Bergman. Einar Löfstedt visited Greece and Asia Minor in 1876–1877. He participated in the German excavations at Olympia and saw Schliemann unearth the gold from the shaft graves in the Grave Circle A at Mycenae. Löfstedt was Professor of Ancient Greek at Uppsala and upon his return lectured vividly on his experiences to his students. Ten years later Centerwall made approximately the same journey. He was a teacher and later the headmaster of a high school at Söderhamn in central Sweden. He was also a Member of Parliament. In the controversy between Schliemann and his opponents Centerwall took no side. He made Schliemann’s discoveries known to the Swedish public, and wrote an interesting book on his travels to Greece and Asia Minor, Från Hellas and Levanten (From Hellas and the Levant), which appeared in 1888. Johan Bergman was also a teacher and an MP. He came to Greece in the 1890s and was of the opinion that Sweden must not only contribute to the research into ancient Greek culture but also found an institute in the country. This is the background against which we must view the first Swedish archaeological excavations in Greece in the Poseidon Sanctuary at Kalaureia (Poros) in 1894. Almost 30 years would pass before there was another excavation. In the meantime, in 1909, the two first chairs of Classical Archaeology were created at the universities of Lund and Uppsala. The basis for a greater involvement in Greece was laid. During the 1920s and 1930s several large field projects were carried out in Greece: Asine, Dendra/Midea, Berbati, The Swedish Messenia Expedition, and Asea. Still it was not in Athens but in Rome that a Swedish archaeological institute was founded. The reason for this was that Latin was a more important subject than Ancient Greek in Swedish high schools and it was through the Roman culture that Greek culture was transmitted to our country. We know that Sweden would have been welcome to open an institute in Greece at the time, but it did not happen until after the Second World War. Two businessmen took the initiative of the founding of the Institute: the chairman of the board of the Swedish Orient Line, Herbert Jacobsson, and its representative in Greece, Consul General Eugenios Eugenides. These two gentlemen contacted Professor Axel Boëthius at Göteborg and together they approached Crown Prince Gustaf Adolf, the initiator of the Asine excavations. The Swedish Institute at Athens was thereafter constituted on 25 April 1946 at the Royal Palace in Stockholm. Due to the Civil War in Greece and the Greek archaeological authorities, who wanted no more permits issued to archaeological institutes, it would be another two years before the inauguration could take place. What about the Red Cross? During the German occupation of Greece in World War 2 the International Red Cross, after some time, managed to obtain permission to distribute food to the starving population. As Switzerland and Sweden did not participate in the War, they handled the distribution. Several of the Swedish delegates were archaeologists who had worked for years in Greece, knew Greek, and knew their way around the country. The most famous of them was Axel W. Persson, who had led the excavations at Asine, Dendra/Midea and Berbati. He lived for two years in Tripolis in Arcadia with his wife who was a doctor, and passing by Tripolis became a “must’’ for every new Swedish delegate to take up his post in Greece. The Institute was originally housed in two apartments in Voukourestiou 29. In 1976 it moved to the neo-classical building in Mitseon 9, where it remains today. The first Director of the Institute was named Directeur d’Études. The Swedish government gave its first grant to the Institute in 1959 and in 1966 it was able to institute its first yearly scholarship. In 1987 the position of Assistant Director was created. However, it was not until ten years later that this position became a regular one through a budget raise.